TRAVEL INSURANCE - Before you head off to Thailand "Land of Smiles" make sure to check your coverage for overseas travel & purchase additional coverage if necessary. The world of travel can be an unpredictable place & from unexpected hospital stays to flight changes & cancellations, you will want to make sure you are covered. VACCINE REQUIREMENTS – While the majority of Canadian citizens will already have the required vaccinations for travel in Thailand, it is wise to check in with your doctor to ensure that no boosters are needed & that all of your shots are up to date. Your doctor may also recommend additional shots or medications like malaria or rabies depending on your region of travel, so do your research & travel safe! TRAVEL DOCUMENTS - When you are traveling internationally your passport is your most valuable possession. Not only do you want to be sure that your passport is valid for at least one year from your date of departure, but you will also want to ensure that there are blank pages clear for arrival/ departure stamps, and that your passport has not been damaged in any way. BANKING & CREDIT CARDS – We always recommend that our travelers come prepared with both a credit card & debit card just in case one or the other is rendered useless. Be sure to call ahead to your bank & report travel to avoid being cut off, and ensure that each of your cards will work in International ATM's. CLOTHES - Yes! Believe it or not you will need clothes in Thailand! And while I am not going to get into too much detail about styles or numbers of each item (everyone packs differently), I will say "Pack light & be respectful." A great rule of thumb is to lay out everything that you think you will wear on your trip ... & then pack about half of that. For Thailand specifically, it is also important to keep in mind that you will need your knees & shoulders covered for visits to religious monuments or temples, so if you are planning to do a lot of cultural excursions you will need to adhere to that dress code. FOR YOUR FEET - Depending on the type of traveler that you are, you will likely require at least 2 styles of footwear throughout your trip. If you intend on doing a lot of hiking, climbing etc. then a comfortable pair of sneakers or hiking sandals is recommended. If you are more of a beach bum, then flip-flops will certainly do. It is important to remember that in Thai culture it is customary (& polite) to remove your shoes when you enter a restaurant, shop or temple, so something easy to slide on & off will be a necessity! SWIMWEAR - If you are traveling to mostly beach destinations in Thailand, you will be surprised at just how often you wear your swimsuit under (or instead of) your normal clothes. Especially in the case of men who will often wear board shorts in place of regular shorts. Keep this in mind when you are packing & consider grabbing at least one extra set of swimwear. MOISTURIZER & SUNSCREEN - The combination of extreme sun & saltwater in Thailand can definitely do a number on your skin, and while both sunscreen & moisturizer can easily be picked up at any local drugstore or 7-eleven in Thailand, many contain skin whitening agents that most Western travelers do not want (or need.) Both can also be found easily without skin whitening ingredients, but will often be imported & more expensive than local, whitening brands. SOMETHING WARM - The Thai people seem to love their air-conditioning, and while you can control the temperature in your hotel room, you will not always be in control of the air on your flights, buses & train rides. Do yourself a favor & bring along an easy-to-pack, light pull-over & stay comfy on long travel days! EAR PLUGS - If you are staying in the heart of the city, booking dorm style accommodations, or traveling on overnight trains, planes or buses, then ear plugs are a must! They are cheap, easy to find and easy to pack, so please buy some. There is no excuse. SUNGLASSES - While many travelers love to pick up a cheap pair of knock-off Ray-Bans the moment that they land in Bangkok, we recommend packing a pair from home (Ray-Ban or not) that are guaranteed to protect your eyes from UV Rays. 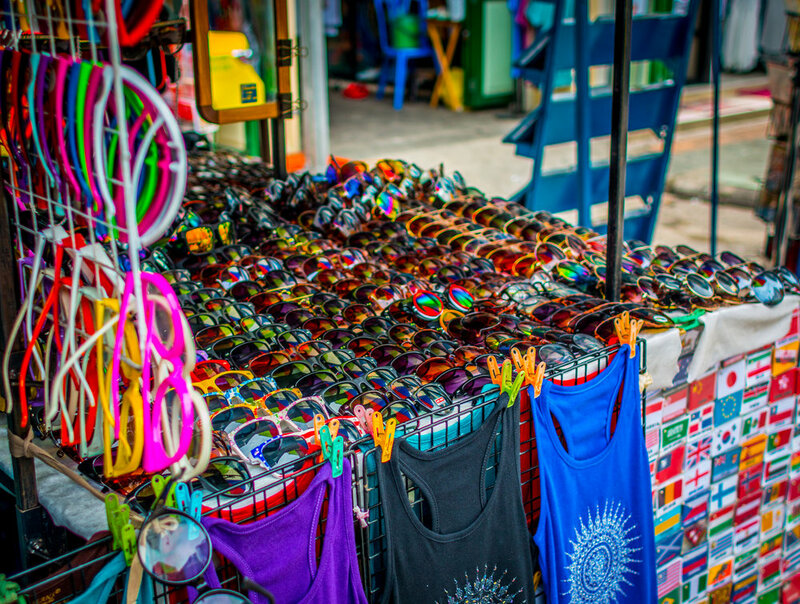 Although the sunglasses in Thailand may be stylish, they may not be quite as protective as they should be (or claim to be). THAI SIM CARD - If you are considering purchasing an International phone plan from your Canadian / US cell phone provider - stop right now - you are making a mistake! Save yourself a huge travel expense by picking up a local Thai tourist SIM when you land at the airport & get unlimited data, calling, texting & more for less than $20 USD. That said, be sure to have your cell phone unlocked BEFORE you go. Packing can be stressful & at the end of the day, everyone packs differently depending on their own needs & travel style. That said, a messy bag makes for a messy trip, so think "less is more" and pack only what you will need for the perfect, stress-free holiday. Is there something that you never travel without? Leave a comment below & let us know!